From a horse-drawn carriage in 1903 to modern-day tractor-trailers, Hilldrup has seen many advancements throughout our 115-year history. And the best is yet to come. Hilldrup is pleased to announce that our fleet’s newest additions will be two Tesla Class 8 electric trucks, the Tesla Semi. 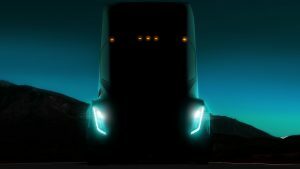 With expectations to outperform its diesel counterparts in every aspect, the Tesla Semi prototype was presented in November 2017 by Elon Musk, co-founder and CEO of Tesla, Inc. Hilldrup expects their arrival by late 2019 and will evaluate the need for additional trucks after initial performance reviews. So, how does the Tesla Semi compare to Hilldrup’s current trucks? Fully loaded, the Tesla Semi is able to travel 500 miles at 60 mph on a single electric charge. The aerodynamic design and drive train will power the cab and trailer, at a max gross weight of 80,000 pounds, from zero to 60 mph in 20 seconds. But it’s not just speed that makes the Tesla Semi a state-of-the-art driving machine. The safety features are just as impressive. The safety features, all part of Tesla’s “Enhanced Autopilot” system, include automatic emergency braking, lane-keeping and lane-departure warning systems. Also included are cameras atop the cap to provide the van operator a 360-degree view around the semi. The surround view is displayed on touchscreens within the cab for the van operator’s awareness. Goodbye, blind-spots! For Hilldrup’s van operators, the truck is their life, their business and even their home during many moves. The Tesla Semi’s interior doesn’t disappoint – it’s a van operator’s dream. The driver’s seat is centered within the cab, all thanks to the absence of an engine, allowing for greater visibility of the roadway. From this driving position, van operators will be able to monitor two 15-inch screens. One screen on the left and one on the right of the driver’s seat, will display the truck’s operational conditions in real time. The touchscreens will offer navigation, ELD tracking as well as the speed and hydraulic pressure of the semi. Customized built-in connectivity will allow communication with Hilldrup’s Operations team to support routing and scheduling. The semi can regain 400 miles of range from a mere 30-minute charge – the same amount of time mandated by the Federal Motor Carrier Safety Administration (FMCSA) for a van-operator to take a break during an eight-hour shift. Musk explained during the reveal of the Tesla Semi that charging the semi would be possible on a new solar-powered Mega-charger network. The dependability of both the truck and van operator ensures that our customers’ belongings arrive safely to their destination. With safety, efficiency and driver comfort at the fore-front of the Tesla Semi’s production, Hilldrup is excited to be on board.